The weather was so much better today, not perfect mind you, there were raincloud in the distance (see above) but they did not bother me, luck was on my side today and I did zig zag between the raindrops. The towel heater did its job and the shoes were dry this morning but I decided that I need backup shoes, something light and flat so that, if I find myself in the lurch, which I might well do in the monsoon of central Africa, at least I can move around. The lady running the B&B was super and for breakfast I got freshly cooked crepes, you almost not miss the english breakfast, but then, you do. I set off at 9:30 and made quick progress. 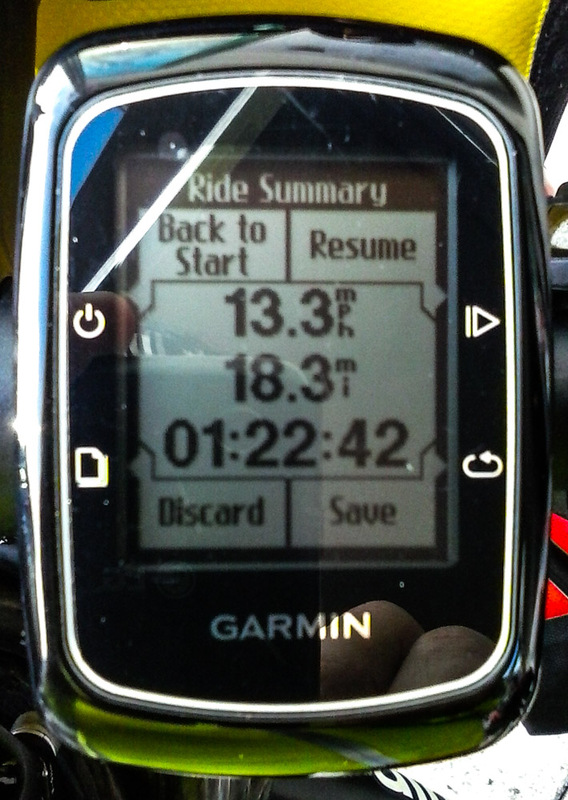 The route today was either rolling hills (low) or flat and I managed to get to the highest average speed so far 13.3 which I managed to keep to the destination only dropping to 13.2 once I hit La Rochelle, I should not have stopped at traffic light, should I? The bonus bit was a Canal path from Luçon to La Sèvre Niortaise where I saw at least a dozen of Herons both grey and white and despite my best stealth mode I miserably failed to record on camera (Don’t I just sound like the proverbial fisherman that caught a 10 pounds trout that then escaped). It is quite tricky to get a balance between becoming a slave of the onboard computer, a slave of the camera, a slave of social media or to just enjoy the ride. I am still finding my feet and it’s nearly a month I’m on the road. I think things will change once I get to Africa, the better weather will bring with it ease of wild camping and therefore no “got to get there” type stress. Also I will by then have found a balance between what I want to record for my own pleasure and what I feel I have to share with the world. I did not do many stops today, one to get some bread and a strange and yet delicious swirly raisin cake which bit the dust by elevenses (as I look like Gandalf I am indulging in a Shire routine sometime). Then I stopped to get a coffee, which like in Italy you get on the fly, and finally I had to keep the appointment I made in Rennes with my Decathlon break pads. This is where the swirly delight came from. Now, if someone cares about me please run to a Judge and get an injunction preventing me to enter another decathlon shop. Aside for the fact that the pads where not there and I have another appointment set in Angles, near Biarritz, I cannot seem to go into the shop without coming out with some new merchandise. Naturally the things I bought are badly needed but…. I bought a lovely M electric blue top that will replace one of my L t-shirts and a pair of dinky flat trainers which at €22 will just be the right shoes backup I needed. I will have to tie myself to the bike in a Ulysses and the Sirens fashion when I go in the shop in Angles to avoid coming out with a canoe or some scuba diving equipment. When I got to the end of the canal path there was a gate, the “I’m lost doubt” is never too far. But I was not, the gate opened. You’ve been shopping? How much do those lovely trainers weigh…? Alex, you have a chair, its called a saddle. Next time we meet you can have the chair back ( for a couple of days). 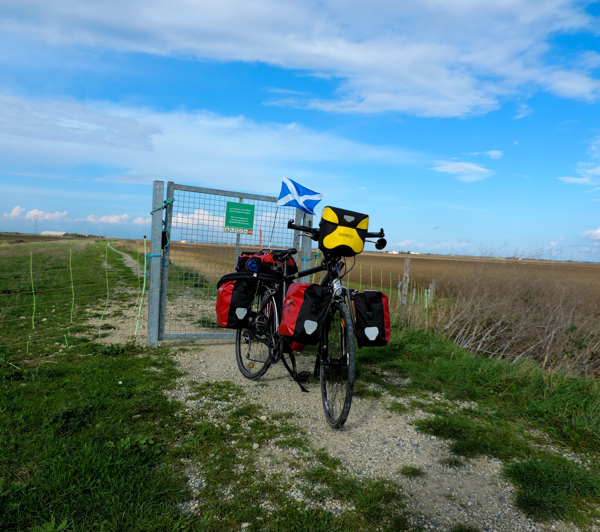 Panniers ok? Might be trial and error with the weight / size if you are having difficulty with spare tyre. You are speeding along we notice. Yes, so far so good with speed, hoping to be in Spain before the end of the first month or there about. Given that the next few days will be quite flats and the legs are performing well I’m going to push past the 60 MpD barrier. Hai ragione, “carpe diem, quam minimum credula postero”. You did say you had wondered how many times you would reorganise the bags during your trip. Dinky little trainers – they must look good! I hope all your purchases are very very light! So glad you’ve had better weather today – yesterday sounded so awful.